When installing and activating W3 Total Cache (W3TC) plugin on WordPress, or after upgrading to W3 Total Cache (W3TC) version 0.9.6, the HTTP (HyperText Transfer Protocol) response code 500 Internal Server Error or Application Error, which indicates that the server or web app encountered an unexpected or uncaught exception that prevented it from fulfilling the request, may be displayed when performing several tasks especially when managing the site in the WordPress admin backend. Sometimes, the blank page appears when you click on some buttons, such as when attempting to manually purge all caches or page caches. In worst case scenario, you can’t even get to wp-admin panel properly, or unable to use editor to update posts, pages, portfolios, media, and other custom post types, whether either you encounter response code 500 error or a blank page or page simply not loading. The problem is caused by new feature called FSD CDN implemented by W3 Total Cache in version 0.9.6. FSD (Full Site Delivery) is a feature to host whole website with a full site content delivery network provider to reduce page load time, so that whole website will appear to load instantly for site visitors. 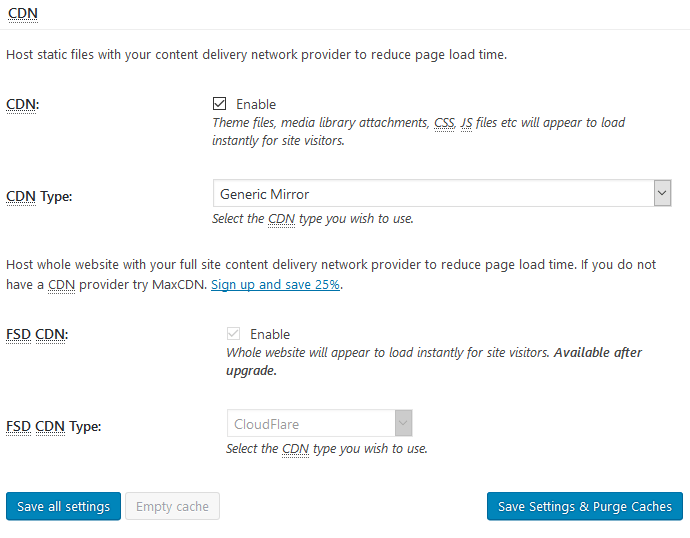 However, for unknown reason, the FSD CDN feature in W3TC is enabled and activated by default, with CloudFlare (other FSD CDN types are Amazon CloudFront, Limelight and MaxCDN) chosen as the FSD CDN service provider, even though the feature is only available after upgrade. The FSD CDN option is General Settings of W3 Total Cache is grayed out and disabled though. Thus, to resolve the issue, SSH into the web server, and edit the ..wp-content/w3tc-config/master.php file. Search for the the section for cdnfsd, and set the cdnfsd.enabled to “0” or FALSE. As the FSD CDN field on WP admin panel is defaulted to True, the setting will revert to “1” or “True” (which enables the FSD CDN and causes the error) on every save of W3TC settings. So remember to change the value after you save any settings of W3 Total Cache. If the setting to disable the FSD CDN does not stick, or fail to solve the error, you can rollback to previous stable version of W3 Total Cache, that’s version 0.9.5.4. You need to manually delete the currently installed W3 Total Cache, and then upload the old version of W3TC before activating it.